Residential sales in the Metro Vancouver area has seen a decrease of 32.6% in September 2016 compared to the same month last year (from 3,345 down to 2,253) and a decrease of 9.5% compared to August 2016. Sales from last month were 9.6% below the 10-year sales average for the month. 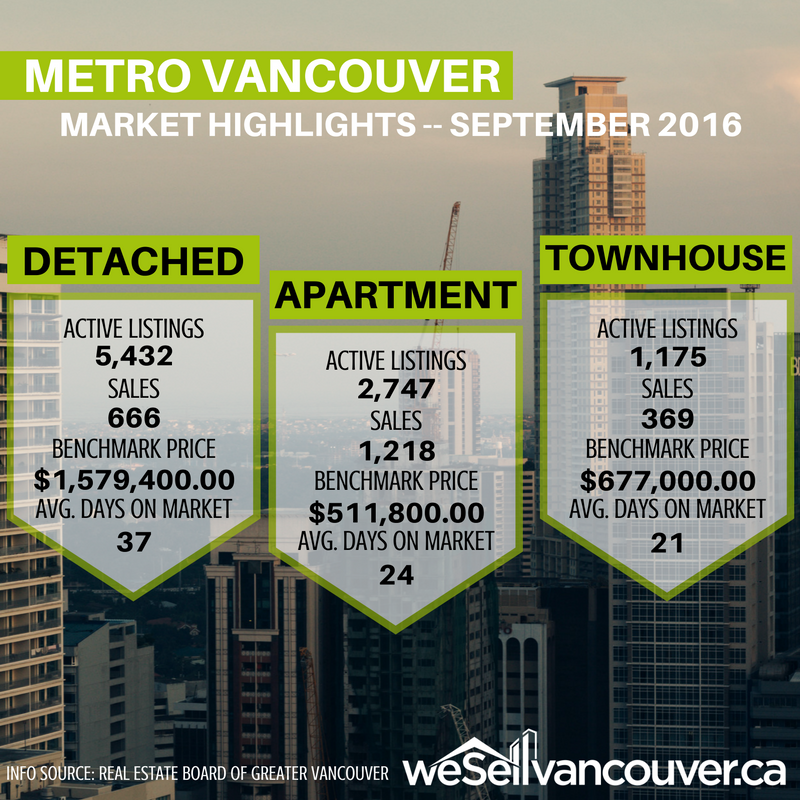 There was a total of 4,799 new listings for detached, attached and apartment properties in Metro Vancouver for September 2016 which is a 1% decrease from the 4,846 units listed in September 2015. On the other hand, it was an 11.8% increase compared to August 2016 (4,293 listings). Current homes listed for sale on MLS® in the Metro Vancouver area has seen a 13.4% decrease (9,354 listings) compared to September 2015 and a 10% increase (8,506 listings) compared to August 2016. The sales-to-active listings ratio has been the lowest since February 2015 with a ratio of 24.1%. The MLS® Home Price Index composite benchmark price for all residential properties in Metro Vancouver is currently $931,900. This represents a 28.9 per cent increase compared to September 2015 and a 0.1 per cent decline compared to August 2016. As for specific statistics on detached homes, apartments and townhouses from last month, you can refer to the image above. Detached property sales saw a decrease of 47.6% compared to September 2015 while their benchmark price increased by 33.7%. Sales for apartments saw a decrease of 20.3% and benchmark price increased by 23.5% in contrast to September 2015. Lastly, attached properties sales decreased by 32.2% and their benchmark price increased by 29.1% compared to September 2015. For all your real estate needs, contact the WeSellVancouver team at info@wesellvancouver.ca or alternatively at 604-801-6654.